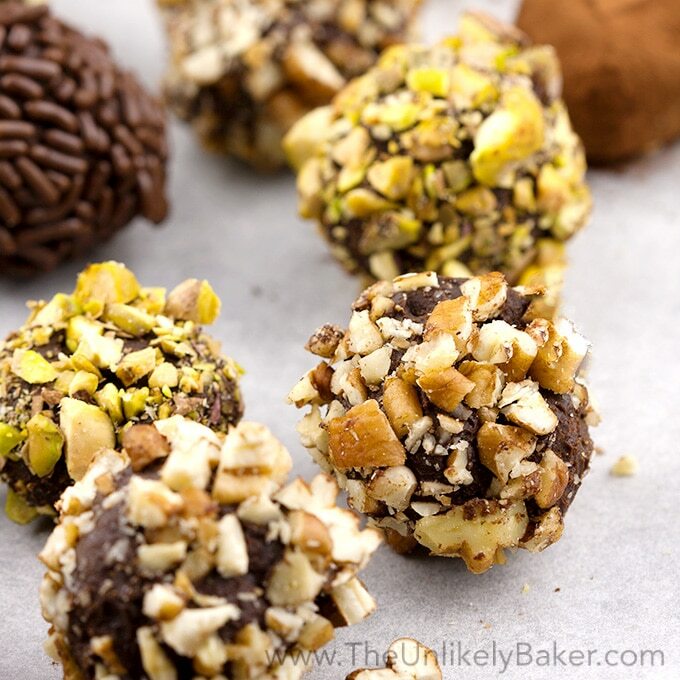 Sweet and tart, fruity and chocolatey, these dried mango chocolate bites are ridiculously addicting! Give them out as presents or snack on them throughout the day. Hi everyone! How did you like our very chocolatey week last week? In case you missed it, check out this recipe for Chocolate Chiffon Cake with Whipped Cream Frosting (perfect for the holidays!) and this recipe for Chocolate Peanut Butter Overnight Oats (perfect for everyday!). I figure we’d take a break from chocolate…not. Who does that? LOL! In fact, I have another chocolate recipe for you today, Halloween is around the corner after all. If you’re looking for a relatively healthier chocolate treat to munch on this Halloween, don’t buy chocolate from the store (now that would really scare your kids haha). 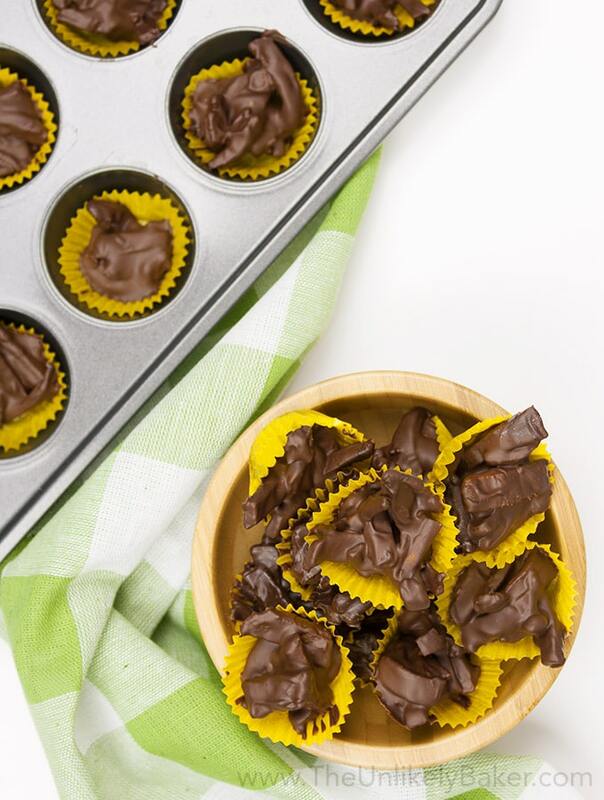 Make these dried mango chocolate bites instead! 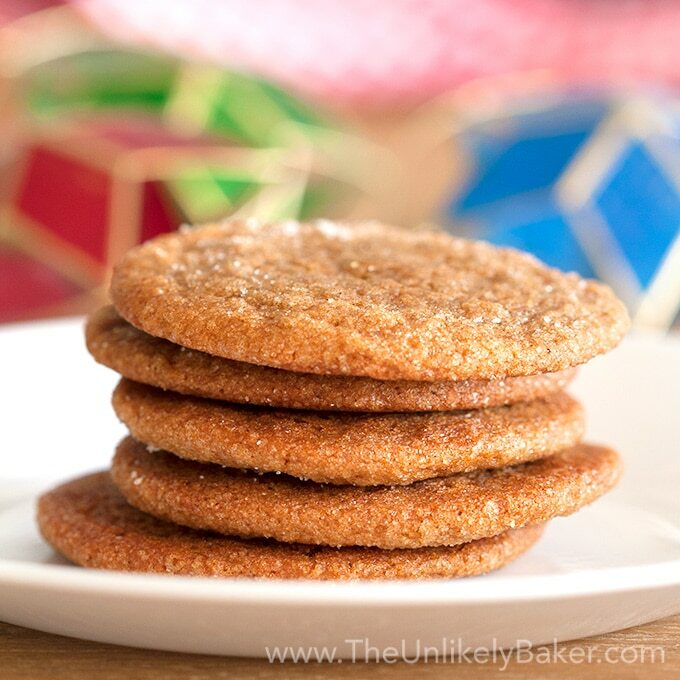 With only two ingredients, they are super easy to make and even easier to eat. I even made a short video to prove it! Have you ever tried dried mangoes? They’re one of the top food exports from the Philippines. And for good reason. They are made from Philippine mangoes (the best!) and are deee-licious. Ingredient number 2 is dark or semi-sweet chocolate which is also good for you! The key is buying good quality chocolate and learning how to temper it correctly. Chocolate that’s not tempered will seize, which is a nicer way of saying it will turn an ugly grey. Really not a pretty sight. Though, it is Halloween. Anyway. I’d say my tempering skills is 7/10 (I started at -10 to be honest with you) so I’ve gotten better but there is still lots of room to grow. Plus, I’m lazy so I do the microwave method instead of the bowl-over-simmering-water method.
. I got mine for less than $15. Divide your chopped chocolate – melt 3/4 and set aside 1/4 as your tempering chocolate. Microwave in bursts of 30 seconds then stir. Microwaves are different so if you think yours runs a little hot, do shorter bursts. You only need to remember two numbers: 115F and 90F. So how do you temper chocolate? Roughly chop your chocolate. Try for same-ish sizes. Put 3/4 of that in a microwave safe bowl and microwave for 30 seconds. Then stir. Repeat until your chocolate is about 50% melted. At this point start to measure temperature as you microwave/stir. Monitor until you reach 115F. Once you reach 115F step away from the microwave and add the tempering chocolate you set aside. Then stir again. Stir like your life depended on it! And constantly measure the temperature. Your chocolate is tempered when you’re down to 90F. And you’ll know too because your chocolate would be all nice and shiny. 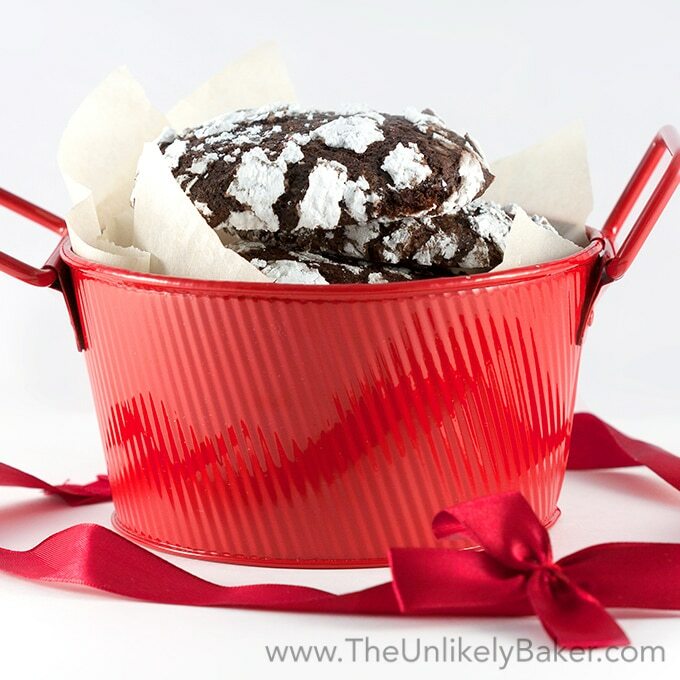 You can also do a test – smear some chocolate onto parchment paper. Properly tempered chocolate dries quickly and has a snap to it. Not quite there? Stir some more. You may need to drop 2 more degrees or so. BTW, this is for dark chocolate. If you’re tempering milk or white chocolate, melted temperature should be about 110F and tempered should be about 85F. It may happen that some of the tempering chocolate you added in does not melt completely. That’s OK. Just scoop them out (we eat them). Also, remember that changes in temperature affect your tempering so it might not be a great idea to do this if you’re cooking/baking something or you’re constantly having to open the kitchen window/door. So where was I? Ah, these amazeballs dried mango chocolate bites. You may be wondering: why can’t I just dip the dried mango in chocolate? You can. But where’s the fun in that? These guys look great served in a bowl or as foodie presents for the holidays. And they’re really super easy to do. Just check out the quick 30-second video! See how quick and easy that was? So whether you make these for Halloween, or as presents for Christmas, or just snacks for tomorrow, hope you have fun making them. And eating them! Prep a 24-cup mini cupcake pan by lining with mini candy cups (see notes). In a medium bowl, stir ingredients together until mangoes are coated with chocolate. Scoop about a heaping tablespoon into your candy cups. When you slice the mangoes, try to slice them into equal sizes. I'd recommend 1 inch long and about 1/8 inch thick. This recipe usually yields about 30 bites for me so I use two pans. However, this mostly depends on how much you put in each cup. Be sure to use candy cups (you can also use glassine cups) and not normal cupcake cups. Candy cups are waxed and normal cupcake cups are not so the chocolate will stick. If you don't have them, just scoop the mango bites into a baking pan lined with parchment paper. They will spread; just try to keep them as compact as possible. These will keep for about a week in an airtight container. No need to refrigerate. 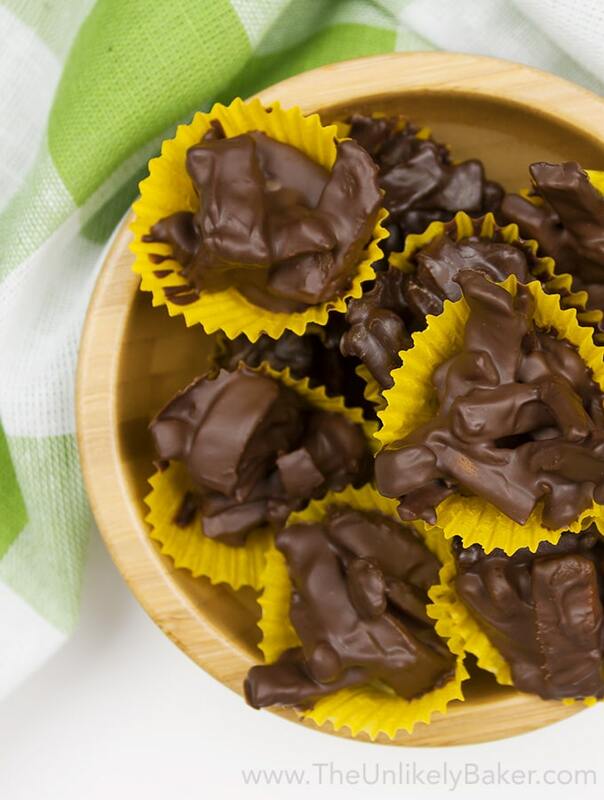 Did you make dried mango chocolate bites? I’d love to hear from you in the comments section below. Do you have other chocolate tempering tips? Melting chocolate can be hit or miss. I can’t wait to try this recipe though. Oh my gosh, YUM! I need to try these! My husband loves mango 🙂 Thanks for sharing! I am a big fan of mangoes and I obviously chocolate but I have never tied this combination!! I love the idea. Sounds so good! Yum! You had me at chocolate. Wow, this is a chocolate night in my blog visits! And oh.my.goodness. I will have to make these mango bites! I mean, I’ve had chocolate-covered bananas, strawberries, cherries … why not mangoes? Oh, this looks so delicious! I’ve never tempered chocolate before. I will have to try your method! Oh wow I’ve never thought of mixing chocolate and dry fruit before. It seems fairly easy to do too. Going to try my hand on mastering this one and who knows i might experiment with apricots and other dry fruits. Chocolate and dried fruit go so well together. Enjoy your chocolate experiments! Mango and chocolate sounds like a heavenly combination! 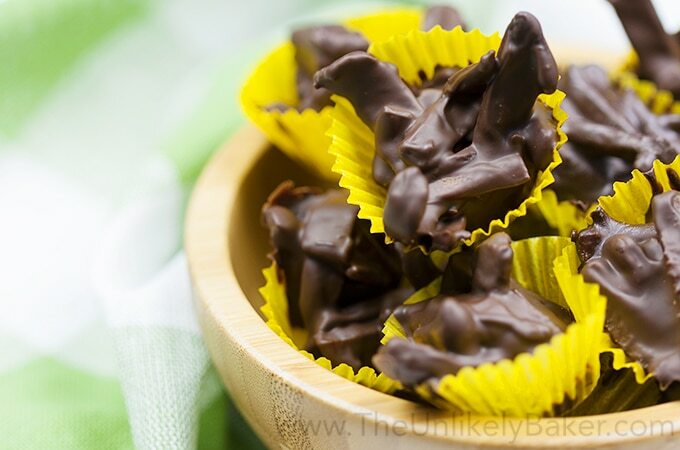 I love that you can make your own chocolate covered fruit so easily. I’ve got a bad sweet tooth, actually a whole mouth full of sweet teeth. Adding fruit to my chocolate will make me feel a little better about gobbling down sweets by the handful. These dried mango chocolate bites look absolutely delicious. I would give them a try! I need a new yummy treat recipe idea, this is perfect! Oh this is really neat! I wouldn’t mind making some of these mango bites. I really should try out the chocolate tempering method. I don’t think I have ever had a mango!! These look really good, I love combining fruit and chocolate! I will try anything with chocolate as a main ingredient! I love the addition of the mango. Yummers! Yum! I’m not sure if I’ve ever had chocolate-covered mango, but I bet I’d love it! This is a fabulous recipe I can’t wait to try! Tempering chocolate is so important for good candy making but, man, it’s such a pain haha. Great tutorial! I would never have thought of covering mango in chocolate, great idea! You know they actually have a chocolate pan for tempering?? I know! It seems like you’d have to make an awfully lot of melted chocolate to have a pan. Your suggestions are great. I’ve melted quite a bit of chocolate and I do it over a double boiler — your way seems easier. And as far as your mango goes, I’m looking for it. Your bites would make great gifts!! I love this! I have pinned to my chocolate board….yes I have a chocolate board because I love chocolate. Thanks for the tips too. I never knew what it meant or how to temper chocolate. I just know from a few fails in the kitchen that chocolate can get bad in a recipe. Great post! Thanks Denise! I’d say my tempering batting average is getting better. So I keep practicing – no complaints. I mean, chocolate! LOL! And don’t tell anyone, I have 3 chocolate boards haha! 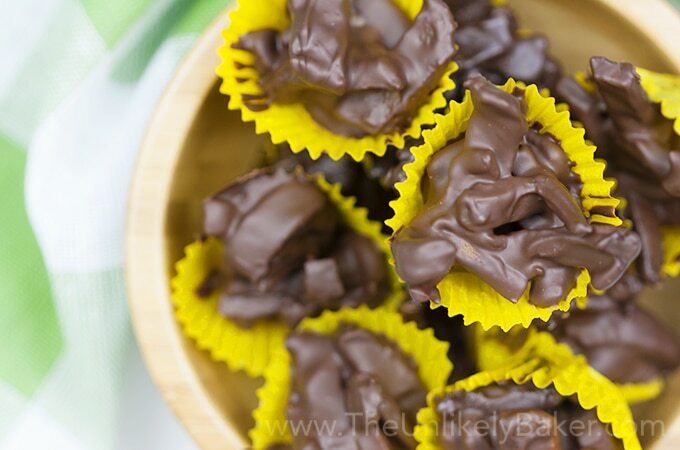 These Mango Chocolate Bites look incredibly delicious! I also appreciated the tips on working with melted chocolate, as I have had not-so-good results in the past! Dried mango chocolate bite looks fantastic. I’m totally carried away with this. Nice informative recipe, I always wanted to make one and eat. Wow, very interesting. Do you think this would work with fresh mango too? Thanks for sharing! I haven’t tried but I don’t see why not? I guess it will be like a fondue! I have never thought to pair mango and chocolate together. Sounds like a tasty treat. Love when things that taste so good are also so easy to make. I think these might even be addictive too. I grew up eating mangoes so I basically eat it with anything LOL! I have never had mango and chocolate together! This sounds amazing! I swear I live on dried mangos and apricots! Thanks Missy! Mmmm dried apricots and chocolate sound like a great combo too…. Holy wow! These look so incredibly good. I am all about chocolate and mango, so put them together and I am all over that. Chocolate covered anything is delicious! I really want to try making this! Right?? Put chocolate on anything and you have a winner 🙂 Enjoy! Wow, I am lusting over these little bites! 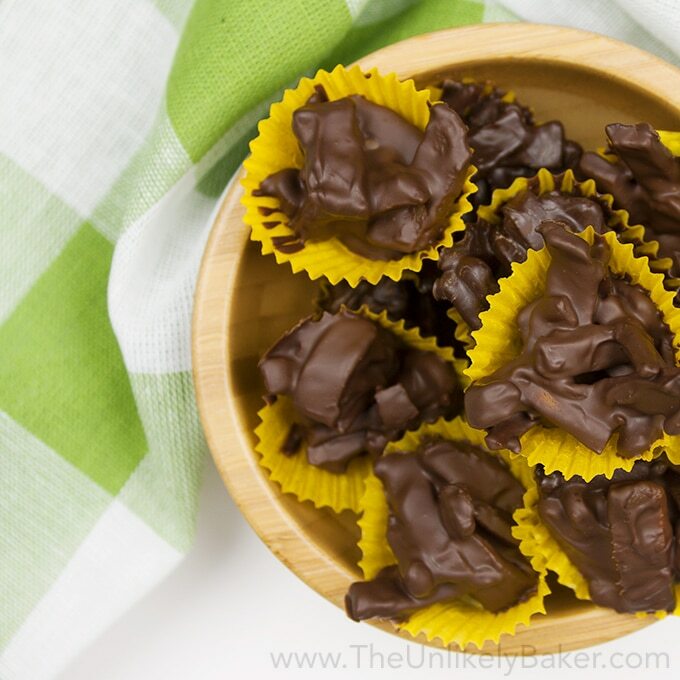 The fact that these dried mango pieces are drenched in chocolate is exciting! YUMMY! I want to try this recipe! Oh my gosh these sound heavenly!!!! I can’t eat such things because I’m diabetic but I think these would make lovely gifts to give for the holidays!! I love making chocolate covered things! Mango is a great idea. 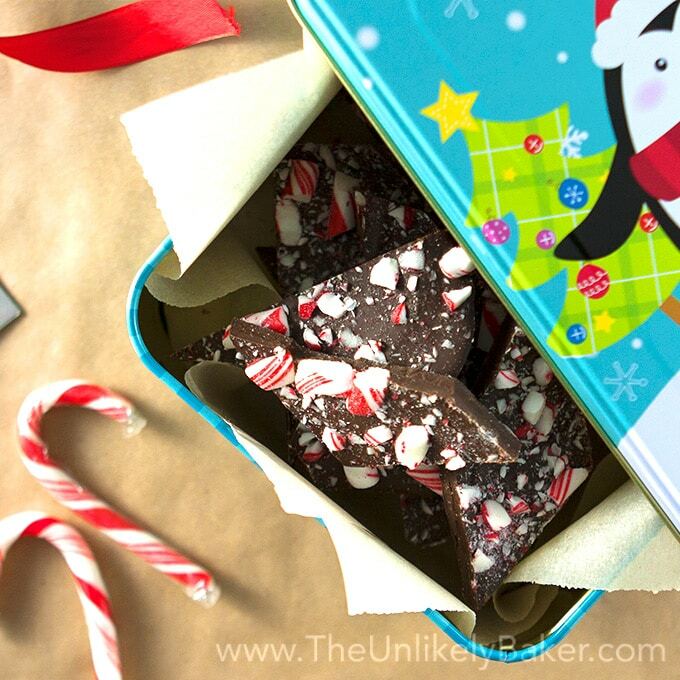 Will have to add it to my holiday chocolates list this year! I am in the market for a good quality sugar free chocolate. Once I found one I will give this recipe a try! Dried mango chocolate bites sound amazing. I love dried mango and I never thought it can be paired with chocolate 🙂 I am going to try this recipe definitely! Hi Mayuri. They are awesome together 🙂 Hope you like ’em! Oh my, this looks great! I’ve seen dried mangoes in supermarkets, not sure if they come from the Philippines, and I’d be scared to death at the chocolate tempering! I’d love to give them away as Christmas presents! Hi Cynthia! I think most dried mangoes are 🙂 I won’t like, tempering scared me in the beginning too! Practicing is a delicious process though. And if you like, you can try chocolate candy melts – they are less…fussy…than couverture chocolates. Have fun! Oh this looks so yummy! It doesn’t look too hard to make but I never had the idea! Have you tried with other dry fruits than mango? I love dried mango and I love the idea of turning them into chocolate bites. They look so appetizing and would make the perfect snack! I loved the quick video as well ! Wow!! It’s new to me. This dried mango chocolate bite looks so yummy. Perfect for on the go snack. I will check this out. Frankly. I had no clue of tempered chocolate until now. Wonderful idea. I’m pretty sure it tastes as good as it looks:) Will give this a shot! Looks so beautiful which is one important thing together with the taste of course. Those bites would make such a great afternoon snack with a cup of tea. This is totally cool. I’ve never even seen anything like it done actually. Tempering chocolate was nothing I”d heard of, love it! Tempered chocolate…..hmmmmm- I’d say more like microwave chocolate most times for me, lol. I love how easy these are and kinda (maybe sorta) guilt free cos there is fruit? Just roll with it 😉 P.S. your nails are always so pretty! Hey Dawn! Yes, let’s call these guys guilt-free. I mean, FRUIT. Haha! Aw thanks, TBH I time filming my videos when I have fresh manicure on teehee. I’m a chocoholic and these look amazing! I’ve never tempered chocolate so I appreciate the video. I just might be able to make these! These look seriously delicious. I’m definitely giving these a try. Who gets tired of chocolate? I DON’T! You had me at chocolate plus the addition of dried mangoes. Right? Me neither! In fact, I just had a bite of chocolate now haha. Thanks Elizabeth! Chocolate AND Mangos?! What a combo!! Have to try this recipe, thanks for sharing! I don’t know the last time I tried a mango, and I know I have never tried them dried. However, after this post, you have me wanting to make a trip to the store! The photos look great and I love the addition of the video! Great touch. Thanks Shawna! Hope you like them!